One of my summer classes started last week. LIS 415: Information Organization, or The Class Formerly Known As Cataloging. I know that I have expressed mixed feelings about my experience in library school and my opinions of libraries in general, but this class makes me feel a bit nerdy and squishy inside. Categorizing! Creating organization systems! Spreadsheet after spreadsheet after spreadsheet! I respond to that primal, human urge that causes children to collect thousands of rocks/buttons/My Little Ponies/bouncy balls/Pokemon cards and then spend hours placing them in jars/baskets/muffin tins/rainbow order. I get regular urges to play with Legos again; for me, “playing” with Legos was more likely to mean digging all the tiny Lego people out of the bin and separating their parts into piles and display cases and setting up a strange, Frankenstein Shop of Horrors where I could match the exact legs, torsos, faces, and hairdos needed for the optimal Lego Population. Organizing stuff still remains a hobby of mine, although my “things” have now become more theoretical than actual. I can schedule my days and nights six ways to next Sunday. I can make spreadsheets so nerdy that I can’t even tell you about them. My mind whirred, trying to think of something that actually made sense, that I could tell the class about. All I could think of was my silverware drawers. We have two. When we first moved, I used one drawer for everyday utensils and the other for things like measuring cups, spatulas, and the egg separator. However, the two drawers were not created equal – the Everyday Drawer is deeper and taller than the Occasional Drawer – and therefore more prone to getting jammed with larger items like measuring cups, spatulas, and the egg separator. This was just an occasional annoyance, until one day a drunk friend pulled too hard and yanked off the entire front of the drawer. The rest of the class wasn’t doing much better. One girl offered up her spice collection. She and the professor riffed on different ways to sort your spices: alphabetically, of course, but maybe savory/sweet might be a better arrangement, or by size of the container depending on your space constraints, or maybe brand if you liked to keep fancy spices for fancy occasions. Yes, yes you would, Professor of Mine. My spices are literally shoved anywhere I please, I can never find them when I need them, and they are constantly laying over on their sides or falling out of the cupboard and cracking the lids. Despite my penchant for organize living, I’m a freaking slob 98.8% of the time. The truth: my apartment is not currently governed by the laws of any classification system or logic whatsoever other than When I Unpacked Last September, That’s Where Things Went and Whatever I Used Last Is Probably Still Sitting On The Top of the Pile of Crap. However, I still feel those metaphysical urges to sort my buttons, to see things in the place that they belong, to disassemble all my Lego people, to ALPHabetize my BOOKS! So I’m trying to grasp at some agency and organize some of the physical things in my life rather than just the theoretical. Some of these can be fixed with the creation of good routines. For example, I’ve been training myself to unload the dishwasher in the morning while I cook my breakfast, to put away my makeup after I put it on in the morning, and to clean the kitchen to a sparkle before bed. These things all involve doing a specific action at a specific time, and aren’t too hard to develop. Other problems require the occasional setting-aside-of-time to tend to semi-regular chores. Making time to do the nitty-gritty cleaning on the weekends. Designating a weekend to reorganizing a room or switching out a seasonal wardrobe or adding to the Goodwill pile or sorting through the semester’s school papers. Those changes are harder to make because occasional tasks can’t be hardwired into your life like a true habit. You have to really prioritize the task at hand r within a few months, you can get completely swamped with nonsense. The worst problems to fix, I think, are systemic. It’s one thing to walk yourself into the kitchen to scrub the counters every night, it’s quite another to teach your hands not to put things down (cups, papers, notebooks, books, anything) and forget about them until they are stacked to the ceiling. Slow but steady. Some people are hardwired for this stuff. Despite my better wishes, I am not. In the best circumstances, I am kind of neat. In the worst, I am pretty messy. When I say my apartment is arranged by “Proximity To Where The Cardboard Box Was When I Opened It Last September,” I am not joking at all. 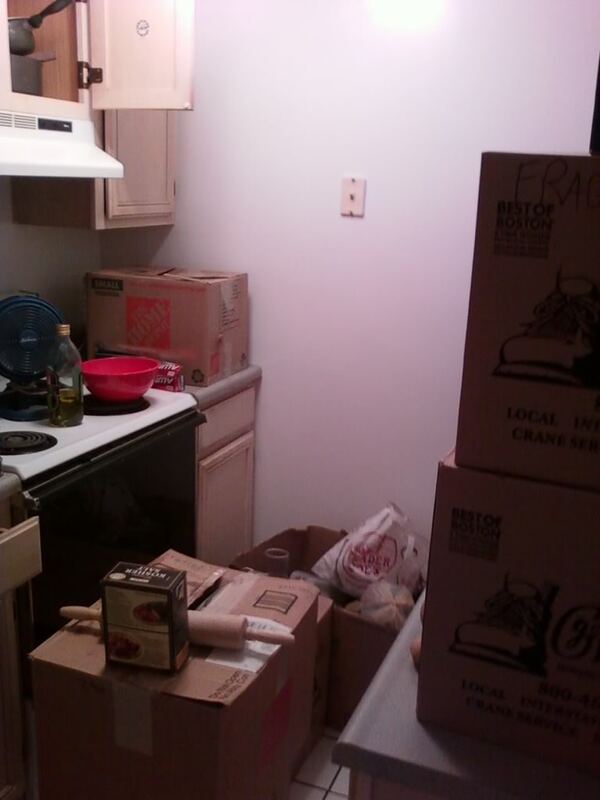 I couldn’t eat without unpacking all those boxes, so I had to do it quickly and efficiently. Proximity (I put the microwave there, so there it will stay) and uncomplicated logic (my roommate is short so I should take the cupboard over the stove) prevailed. For an example of how this logic has failed me, see: kitchen drawer anecdote above. Many people do amazing thing organizationally with small spaces. I am jealous. However, I am but a lowly grad student who barely cleared 15k on her income taxes last year. I cannot afford most of the nicer things at IKEA, much less custom-fitted shelving. But money and space needn’t cripple me. I’ve set myself against a few tasks in the past month or so that have made a surprising impact on my day-to-day life. I moved the microwave from one counter to another…. and doubled my kitchen workspace and made the entire room seem bigger. I cleaned out under the sink and in the pantry closet – not only do I not suffer from falling brooms smacking me in the face any longer, but I found a load of useful goodies in there! Two bottles of unopened dish soap, a pack of 100 bendy straws, and a Magic Eraser! And yes, I could probably spend some more money on organizing crap, too. I’m not THAT destitute. Just like putting time aside to mop the floors, putting a little money aside once in awhile for some new plastic tubs or shelves is just a matter of prioritizing. And what I lack in money, I make up for in creativity.